Der Blaue Reiter [The Blue Rider] was initiated in 1911 by the young painters Wassily Kandinsky and Franz Marc and was active until 1914. 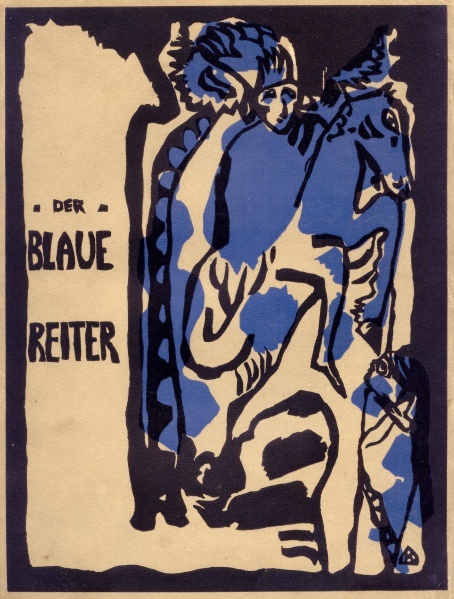 Conceived in June 1911 and published in Munich in May 1912, Der Blaue Reiter (Almanach) [The Blue Rider Almanac] presented their synthesis of international culture to the European avant-garde at large. The Almanac was published in an edition of 1100 copies. Its costs were underwritten by the industrialist and art collector Bernhard Koehler, a relative of August Macke. It contained reproductions of more than 140 artworks, and 14 major articles. A second volume was planned, but the start of World War I prevented it. Instead, a second edition of the original was printed in 1914. * Kandinsky’s The Yellow Sound.